Even though Takashi Miike is an extremely talented director, I have never really been a fan of him. I saw ICHI THE KILLER, the DEAD OR ALIVE trilogy, YATTERMAN, AUDITION, THE HAPPINESS OF THE KATAKURIS, and THE CITY OF LOST SOULS. I wasn’t crazy about any of them. These movies had some interesting and creative-filmed scenes, but they did not add up well to a whole. All I saw was a talented director without direction or balance. I think that THE GREAT YOKAI WAR is his first real masterpiece. This movie is a perfect balance of Takashi Miike’s brain – horror, comedy, sci-fi, fantasy, nightmarish imagery, elegant pretty imagery, memorable characters, excellent CGI and trippiness. The movie is a masterpiece for its genre and Takashi Miike is a genius. I love this movie and I’m dying to watch it again. The Hong Kong DVD (Universe, NTSC Region 3) is overall very good. The back cover only states that the DVD is “WIDESCREEN,” which made me think it could be letterboxed, but don’t worry, it’s anamorphic widescreen. The video quality is very nice looking, not perfect but pretty solid. The audio has a totally involving reference quality sound – sending out all the sound effects all across the room one would expect from a horror-action-fantasy genre movie. The audio options are Japanese DD 5.1 EX, Japanese DTS-ES, and a dubbed Cantonese DD 5.1 EX. The English subtitles are pretty good with some letters missing from words here and there, but the translation is very good. If you want the plentiful extras (Another Story of Yokai, 2005 Yokai Conference, Short Drama of Yokai, Making of Yokai Movie, Interview with Main Casts, Visual Records of Promotion, Documentary of Ryunosuke Kamiki, The Introduction of Yokai), buy the 2-disc DVD version, which I should have done. For one, I’m dying to see the creation of all the costumes/character make-up they made for this movie. Trust me, these aren’t Mighty Morphin Power Rangers costumes/characters – these are characters that are reminiscent of the original STAR WARS movies. 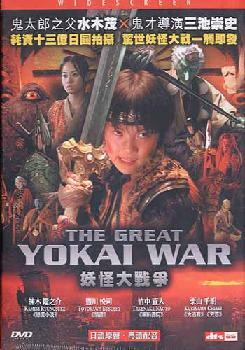 Although I think that THE GREAT YOKAI WAR is the director’s best film, I’m sure many will disagree and say that AUDITION is (it is a good horror movie, but I’m not too crazy about horror films), but it’s certainly a totally entertaining work of art, with not one boring scene in the film. There is a USA NTSC Region-Free DVD now available but the audio is only DD 5.1 Japanese and DD 5.1 English. If you like English dubs or if you can’t play a NTSC Region 3 DVD, then buy the USA version.